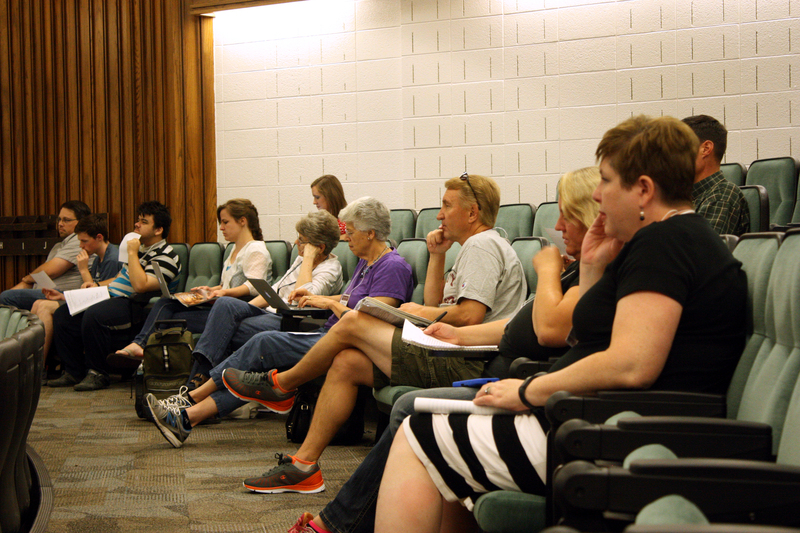 In an Education Week class, humanities professors talked about how to gauge and improve fluency in a foreign language. PROVO, Utah (August 24, 2015)—According to Ray Clifford, the director of the Center for Language Study, language is the most complex of all human behaviors. “There is nothing that humans do that really exists for us unless we have a way to describe it,” he said. It’s clear that even in our native languages there is room for development. But what about in a foreign language? In an Education Week series, College of Humanities’ faculty Jennifer Bown, N. Tony Brown, Ray Clifford and Gregory L. Thompson discussed how to gauge and improve fluency in foreign language. They presented research and ideas on how to measure fluency, the benefits of foreign language housing and language immersion, and how to improve reading and writing in a foreign language. Ray Clifford—Are you fluent in a second language? While the Internet is smothered in assertions that you can “learn business Japanese on your flight to Tokyo” or “speak fluent Greek in 24 hours,” fluency in a foreign language is more nuanced. Even the word fluency has a rather fluid legal definition and can’t easily be pinned down. 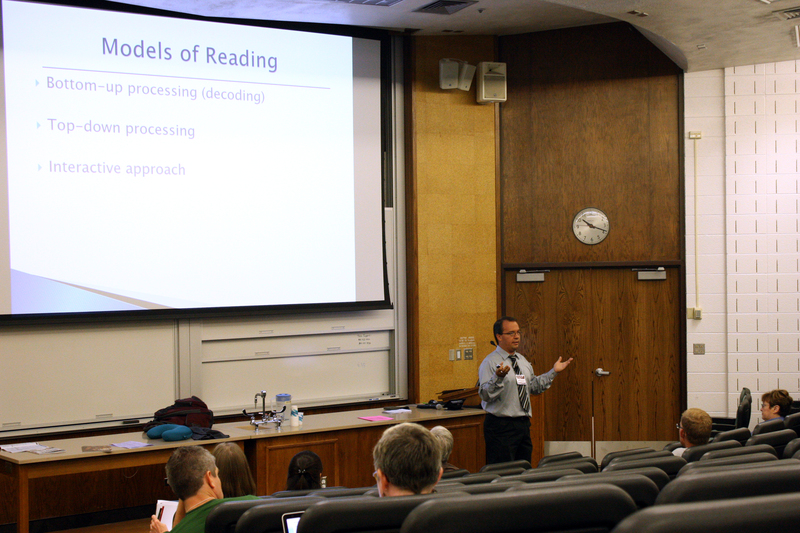 Associate Dean Ray Clifford identified two scales that are used to measure fluency in a foreign language. The first, the Interagency Language Roundtable (ILR) scale, is the standard grading scale for language proficiency in the Federal Service. It grades people’s language proficiency on a scale of 0-5, a zero indicating nearly no or highly limited ability in the language and a five marking exceptional proficiency. Clifford noted that even natives are not always “fives,” as people who rank at that level are typically well-educated, highly articulate individuals. The second scale is from the American Council on the Teaching of Foreign Languages (ACTFL), which breaks proficiency into levels on a scale from novice to superior. These scales give speakers of a foreign language a clear understanding of their language proficiency level. Speakers’ abilities are examined by accredited test administrators, who are able to assess the speaker’s interpersonal communication and presentational speaking, along with their listening skills. Test administrators check the depth and breadth of speakers’ ability by assessing their ease and accuracy in performing a range of communication tasks including stating facts, operating in different time frames, hypothesizing and speaking abstractly. One major milestone that foreign language learners can reach is that they begin to “self-monitor.” This, according to Clifford, is when people begin to catch their own mistakes as they’re speaking. At BYU, foreign language students have the opportunity to live in foreign language housing. Professor Tony Brown himself lived in the Foreign Language Student Residence between a study abroad and a mission, and he found that simply being in an environment in which his second language – Russian – was consistently present facilitated growth that would have otherwise never been possible. Another objective of the FLSR is that it serves, according to Brown, as a bridge between the university and the professional sphere. “Many of these students want to use not only academic language, but conversational language and to talk professionally,” Brown said. Research indicates that living in the FLSR significantly increases students’ ability to communicate in their target language, according to before and after testing using the ACTFL Oral Proficiency Interview (OPI), which Ray Clifford also discussed. The methods of this intense language immersion are daily group dinners, a weekly conversation course with their faculty coordinator, informal conversations with roommates and the language facilitator (typically a native speaker of the target language), Family Home Evening as a group and Sunday worship (Sunday school is in their target language) and, of course, enrollment in foreign language courses (on campus and at the FLSR). According to Professor Jennifer Bown, research shows that time spent writing in a foreign language is a predictor of proficiency gains. In other words, the more you write, the better you speak. Why? The ACTFL Oral Proficiency Exam tests speakers’ ability to speak abstractly and to hypothesize. Levels of writing proficiency follow the same outline as speaking proficiency, beginning at novice and ending with superior. In assessing our own level of proficiency in writing in a foreign language, of few of the following “can-do” statements issued by ACTFL can help us get an idea of where we are. To write well it takes a lot of practice, even in one’s native language. “We teach writing sometimes as being a process that is we plan, then we write or draft, then we rewrite or edit and then we turn it in. But the writing process is a lot more complex than that. There’s a very long process involved, especially in complex writing,” said Bown. Once we gauge where we’re at in our writing abilities, how do we improve? “If we really want to improve our writing, read a lot,” said Bown. Reading formal publications such as books, newspapers, magazines, articles on the Internet and scriptures are great assets for developing writing skills. We can then put our reading to good use by composing journal entries, Facebook and Twitter posts, and emails in our foreign language. Bown noted that in such informal writing it’s easy to keep making the same mistakes again and again, so be sure to have it corrected if you want to prevent learning something the wrong way. Finally, Bown recommended an online resource for improving writing: www.lang-8.com, which is a community of language learners where natives can correct and give advice on the writing samples of language learners. “Reading,” Professor Gregory Thompson said, “is the ability to successfully generate meaning from text.” It takes a lot of practice and effort to be able to decode meaning within text, and in order to really read, there must be some level of comprehension. “For thousands and thousands of years, reading was relegated to a very small portion of the population. Every normal child will learn to speak and listen, however reading and writing are acquired.” And as acquired skills, they require some extra work. Research claims that it takes somewhere between four and ten years to read at grade level in a second language. “The amount of hours it takes to become fluent in a language depends on the language,” said Thompson, and he identified a few tropes that language learners employ – both consciously and subconsciously as they learn new languages. “As we’re learning a language and reading we start to look for stuff that’s familiar to us,” he said, which includes any words we may know, any information about the context of what we’re reading and any sort of cognate to our native language. But beyond just the words of a text, there is a very high level of reading required to understand cultural references. Cultural, social and political references can comprise so much of a text’s meaning, and therefore, in order to really be able to read and comprehend certain texts, one needs a very high level of fluency. Even if the level of reading is very simple, there is often background information and knowledge that is required to understand the humorous, sarcastic, politically or religiously charged nuances. In order to read with “top-down processing,” using which the reader generates meaning by employing background knowledge, expectations and assumptions, readers are able to get much further in their reading, because they don’t have to go word by word decoding everything. Danielle covers the Center for Language Studies for the College of Humanities. She is a senior pursing a degree in Russian with a minor in women’s studies.